Niagara Falls, NY - Lewiston Police Officer Nicholas Cofield and Niagara County Sheriff Deputy Tyler Magliazzo talk to Elva Webb of Lewiston and Pati Piro of Porter about The Yellow Dot Program. Participants fill out a form with medical and contact information and place in the glove box of their car. Then they place the provided yellow sticker on the windshield for emergency responders should they need it. They also reminded the ladies of the "Are You Ok" program for checking up on loved ones. 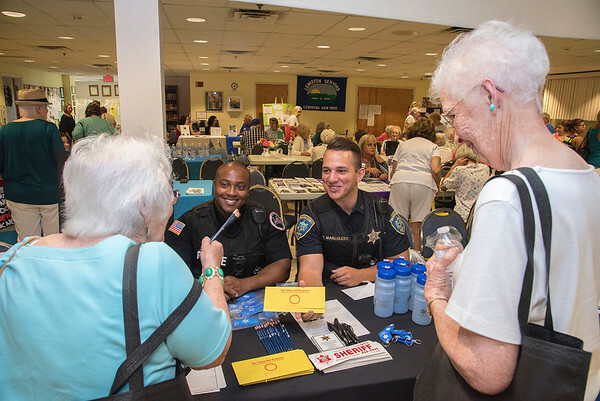 The Lewiston Senior Center held their "Walk By The River" event featuring health and safety agencies sponsored by the Niagara County Office For The Aging.